Waino was doing some recruiting when Garth did him one better. ST. LOUIS — Country music superstar Garth Brooks and Cardinals star Adam Wainwright have a date set, and just in time for Valentine's Day. 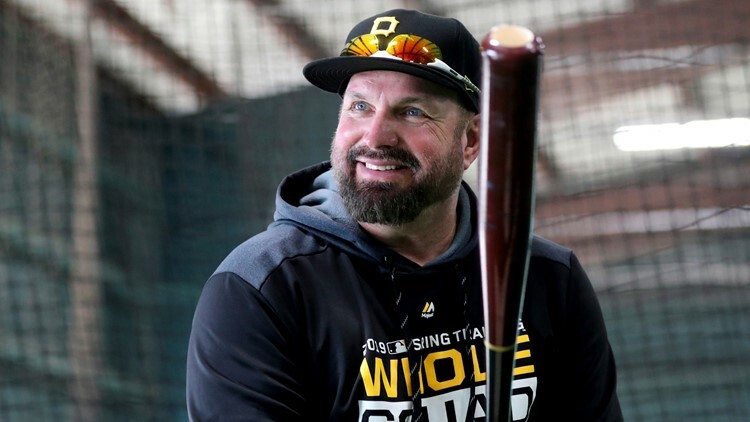 Garth Brooks suited up for the Pittsburgh Pirates Tuesday after signing a week-long contract with the Cardinals' NL Central rival. But that didn't keep Waino from trying to recruit the best-selling solo artist of all time. Wainwright tweeted to G, inviting him to Cardinals Spring Training any time. Garth did him one better, setting up a date with "a little bp, a little outfield" at Busch Stadium the day before he plays at the Dome. The Cardinals will still be in the middle of spring training on the date Brooks suggested(they actually have two games on that day), but maybe Waino will be able to slip away for the date. Tickets are still available for the show. Click here for more information.